You’ve most likely heard of dental implants. But did you know they have significantly changed the way that we do dentistry? Since the advent of dental implants, we have been able to provide patients with more predictable, long-lasting teeth-replacement options. Today, we will discuss the versatility of dental implants, and how they can improve your oral health and overall quality of life. If you are considering dental implants in Lone Tree or Denver, read on to learn more! At Metropolitan Dental Care, we have helped numerous patients complete their smiles and regain chewing function. If you are exploring teeth replacement options, we invite you to schedule a consultation at our practice. To make an appointment, please call 303.534.2626 or complete our online form. We will get back with you right away. 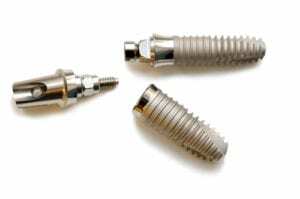 Why are Dental Implants Superior? A dental implant is the only tooth replacement option that also replaces the root. Why is this important? When teeth roots are present, the jawbone is stimulated. This keeps the bone structure and density strong. However, once teeth are missing, the nerves in the jawbone no longer receive signals. Therefore, bone atrophy occurs over time, and the jawbone becomes thinner and less dense. Think of an elderly person who has been missing their teeth for a long time. They often have a “sunken-in” appearance. This is because their jawbone has worn thin over the years. Dental implants correct this problem by mimicking natural teeth roots. Because implants stimulate the jawbone once again, they help to prevent bone recession over time. The result is a natural-looking smile that preserves bone and fosters optimal oral health for years to come. In years past, a single missing tooth had to be replaced with a traditional dental bridge. While we still place bridges today in many cases, a single dental implant is often the most superior solution for a missing tooth. In order to place a traditional bridge, the natural teeth on either side of the gap must be drilled and reduced in order to make room for your new restoration. Conversely, a dental implant does not require the alteration of any natural teeth. Therefore, your healthy tooth structure is left intact. Once the implant has healed, a dental crown can be attached. At this point, your new implant can be used and cleaned just like a natural tooth. Whether you are missing several teeth in a row, or in sporadic locations, dental implants can complete your smile in a conservative, comprehensive manner. If you have a row of missing teeth, we can often fill in the gap with an implant-supported bridge. For example, if you have three consecutively missing teeth, two implants can be placed, and a three-unit dental bridge can be attached. The primary goal is to maintain the structure of your existing healthy teeth while building a strong support for your new restorations. Patients who are missing all of their teeth on the upper arch, lower arch, or both can benefit from an implant-supported denture. In fact, many of our patients who have spent years in a traditional denture now have the option to stabilize their prosthesis with dental implants. With today’s advanced technology, there are often even options for those who have experienced a degree of bone atrophy over the years. No matter what your situation, there are numerous options for you. Depending on your specific situation, an arch of missing teeth can be replaced with a removable or fixed restoration. Our doctors can help you determine which choice is right for you. When dental implants were still experimental, many believed you had to place one dental implant for every missing tooth. Today, we know this isn’t true. In fact, an entire arch of missing teeth can be replaced successfully with six to eight implants per arch. By keeping your treatment conservative, we can keep costs down while providing you with a strong, healthy, long-lasting smile. If you are considering dental implants in Lone Tree or Denver, contact our office today. We look forward to helping you complete your smile. Please call us at 303.534.2626 or contact us online to schedule your consultation.